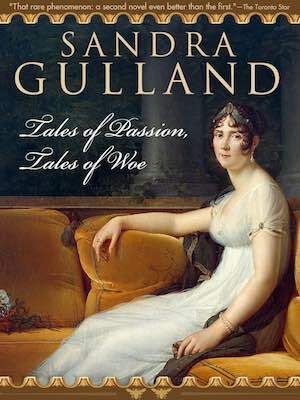 Following the bestselling The Many Lives & Secret Sorrows of Josephine B., the first volume in the trilogy depicting the life of Josephine Bonaparte, wife of Napoleon Bonaparte, the first Emperor of France, author Sandra Gulland continues her narrative with Tales of Passion, Tales of Woe. As previously, Ms. Gulland creates her historical novel in the form of Josephine’s private journals, filling pages with her unguarded thoughts, fears, joys and sorrows. Imagining Josephine’s voice, Gulland provides a unique portrait of a clever and charming woman who married a man of great passion and power and who suffered the consequences of the union. Beginning on the day after her marriage to the “Corsican” Napoleon, we meet a mournful woman, beset by doubts, fearful of her children’s reaction to her marriage and what the future may hold for all of them. For France is in a state of flux. Though the dreaded Reign of Terror was ended and its architect Robespierre was dead, political intrigue is a plague on the land. Only two days after their marriage, Napoleon leaves Paris to take command of the Army of Italy; a month later in April 1796, he opens his Italian campaign and ultimately proclaims six victories. Josephine writes of her husband’s triumphs and defeats, but it is the stresses of daily life that occupy her: the welfare of her children, aiding friends who plead for the benefit of her political contacts, the running of the household and the constant need for money to support the life that is appropriate to a woman of her station. Her marriage was little help in this regard; though Napoleon provided some funds for the running of the household, Josephine was expected to contribute the rest from her own pocket. She is further cursed with Napoleon’s family: a mother-in-law who despises her, three selfish sisters-in-law and four greedy brothers-in-law. Though she attempts at first to charm them, it is quickly evident that nothing can defang this nest of vipers with their thinly veiled insults regarding the six-year difference in age between Josephine and Napoleon, he being twenty-six and she thirty-two at the time of their marriage. Perhaps most cruel of all is her inability to conceive a child, an issue that will eventually threaten her marriage. One of the most startling aspects of Tales of Passion, Tales of Woe is its many parallels to late-twentieth-century life. The manners and morals of the time, the political machinations and intrigues, the profligate spending without thought of tomorrow are all mirrored in the events we see today. Here are moralists and the licentious side by side; here friendships are cast aside in favor of political power; here true friends of the republic fall as opportunists rise. 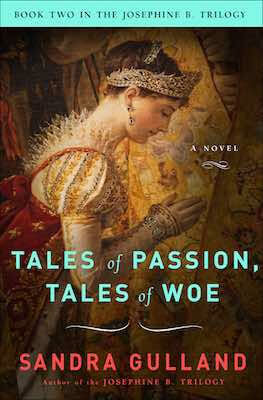 But beyond politics and at its core, Tales of Passion, Tales of Woe recalls the extraordinary love story of the remarkable woman who captivated the man destined to change the world. March 10, 1796 — Paris, early morning, grey skies. I am writing this in my jasmine-scented dressing room, where I might not be discovered by Bonaparte, my husband of one day. Husband. The word feels foreign on my tongue, as foreign as the maps spread over the dining room table, the sword propped in the corner of my drawing room. As foreign as the man himself. My face in the glass looks harsh, etched by shadow, reflecting the dark thoughts in my heart. How unlike me to be melancholy. I’m tempted to black out the words I’ve just written, tempted to write, instead: I’ve married, I am happy, all is well. But I’ve promised myself one thing-to be honest on these pages. However much I am required to dissemble, to flatter and cajole, here I may speak my heart truly. And my heart, in truth, is troubled. I fear I’ve made a mistake. We’ve just returned from Saint-Germain. Bonaparte is in a meeting in the study, and I’m back in my dressing room, seeking solace. It seems that everything is going wrong. Where to begin? This morning, as I was dusting my face with rice powder, preparing to leave, I saw Bonaparte standing in the door. “The coach is ready.” He had a riding crop in his hands and was twisting it, bending it. He was anxious, I knew, about going out to Saint-Germain to see my children at their schools. Certainly, I was uneasy myself. I wasn’t sure how Hortense was going to take the news. “You’re not wearing your new jacket?” I asked, putting on a pair of dangling sapphire earrings. I’d changed into a long-sleeved violet gown over a dotted gauze skirt. It was a new ensemble and I was pleased with the effect, but I couldn’t decide which shoes to wear — my lace-up boots or my silk slippers, which went so nicely. It had stopped raining but was damp out. The boots would be more practical. “The boots,” I told my scullery maid, who pushed one roughly onto my foot. I made a mental note to begin looking for a lady’s maid as soon as Bonaparte left for the south. As soon as Bonaparte left for the south, and life returned to normal. Today, tonight and then tomorrow, I thought — twenty-eight hours. Twenty-eight hours of frenetic activity, soldiers coming and going, couriers cantering into the courtyard. Twenty-eight hours of chaos. Every surface of my little house is covered with maps, journals, reports, scraps of paper with lists on them of provisions, names, numbers, schedules. Books are stacked on the dining room table, on the escritoire, by my bed. Twenty-eight more hours of his fumbling caresses and embraces. Bonaparte works and reads with intense concentration — oblivious to me, to the servants — and then falls upon me with a ravenous need. Twenty-eight more hours of dazed bewilderment. Who is this man I have married? Will life ever be “normal” again? “What’s wrong with this jacket?” he demanded. “It needs mending,” I said, smoothing the shoulder. The worn grey wool was pulling at the seams and the edges of the cuffs were frayed. I would have it mended, if I could ever get him out of it. If I could ever get him out of it, I might burn it, I thought, kissing his smooth cheek. “And you look so handsome in the new one.” The knee-length tails helped detract from his thin legs and gave the impression of height. He kissed me and grinned. “I’m not changing,” he said, tweaking my ear. It was a slow journey to Saint-Germain — the rain had made the roads muddy — so it was early afternoon by the time our carriage pulled into the courtyard of Hortense’s school. I spotted her on the playing field and waved. As soon as she saw us, she dropped the ball and spun on her heels, covering her face with her hands. Was she crying? I touched Bonaparte’s arm to distract him, but it was too late — he’d already seen my daughter’s reaction. He gazed across the playing field with a sad expression in his grey eyes. “Something’s wrong,” I said. I feared what the problem might be. “I’ll wait for you inside.” Bonaparte pulled down on the rim of his new general’s hat. The felt was rigid yet and it sat high on his big head. I squeezed his hand, as lovers do. “I won’t be long,” I promised. Especially considering what she’s had to endure. It has been almost two years since the Terror, yet even now my daughter sometimes wakes screaming in the night. Even now she cannot pass the place where her father died without bursting into tears. My niece Émilie ran to embrace me. “Is Hortense hurt?” I asked. “What’s wrong?” My daughter looked so alone, hunched over by the goal post, her back to us. Hysterics? I’d been warned that girls of fourteen were subject to frightful convulsions, but Hortense was not yet of that age. I lifted the hem of my gown and headed toward my weeping daughter. “Hortense?” I called out, approaching. I could see her shoulders shaking. “Darling — ” I reached out and touched her shoulder. Even through my gloves I could feel her bones — the bones of a girl still, not yet the bones of a woman. I considered turning her, but I knew her stubborn strength. Instead, I walked around to face her. I was startled by the haunted look in her eyes. Pink blotches covered her freckled cheeks, making her eyes seem abnormally blue — her father’s eyes. Her father’s critical eyes, following me still. I took her cold, bare hand and pressed it to my heart. “What is it, darling?” Thinking how she’d grown in the last year, thinking that she was tall for her age, and that soon she would be as tall as I am, taller perhaps. “I’m in afraid, Maman.” A sob welled up in her. “I don’t care! I don’t care for him.” Then she hung her head, seeing the stricken look in my eyes. “I’m sorry, Maman!” She took a big breath and exhaled, blowing her cheeks out like a balloon. I folded her in my arms. “I have to go back. Are you going to be all right?” I felt her nod against my chest. I stroked her soft golden curls. She would need time. We all would. “I’d like you and Eugène to come to Fontainebleau with me next weekend, to see Aunt Désirée and the Marquis,” I said, swaying like a mother with an infant in her arms again, lulling her baby to sleep. I felt a thickening in my throat as I recalled the feel of her at birth, her tiny skull, her piercing cry. It is going to be all right, I wanted to tell her. (I want to believe it myself.) “Can you come next weekend?” Bonaparte would be gone by then. The weathered door to the school creaked on its hinges, startling a maid who was perched on a stepladder washing the crystal candelabra. I heard Bonaparte’s voice, his lecturing tone. I knocked on the door to the headmistress’s study. Madame Campan was seated behind her enormous pedestal desk covered with books and stacks of paper. The small room was furnished in the style of the Ancien Régime, ornate, musty and dark. A vase of silk lilies had been placed under the portrait of Queen Marie Antoinette. Two years ago Madame Campan would have lost her life for showing sympathy for the Queen. The prim headmistress motioned me in without taking her eyes off her guest. Bonaparte was perched on the edge of a puce Louis XV armchair, holding a teacup and expounding on the uselessness of girls learning Latin. His saucer was swamped — with coffee, I guessed, to judge by the aroma. When he paused to take a breath, Madame Campan stood to greet me, smoothing the skirt of her gown. Dressed in black, she could have been taken for a maid but for the intricate beaded trim of the head scarf she wore, as if in perpetual mourning. “Forgive me for interrupting,” I said, taking the chair beside Bonaparte. He searched my eyes for a clue. This was an awkward situation for him, I knew, a difficult situation for us both. Things were not going according to plan. I removed my gloves, tugging on each fingertip. My new gold betrothal ring caught the light. I put my hand over it and said, “General Bonaparte is a philosopher at heart, Madame Campan. He gives all matters thought.” I offered Bonaparte a conciliatory little smile. “Yes,” I said, flushing, seeing him through a stranger’s eyes: a short, thin man with a sallow complexion, lank hair, shabby attire. A coarse-spoken man with poor manners. An intense, humourless man with fiery eyes — a Corsican, a Revolutionary, an opportunist. My husband. “We have an announcement to make,” I told Madame Campan. Only my closest friends knew that we’d married. I wasn’t looking forward to informing my family — nor my acquaintances, for that matter, many of whom would be condescending, I feared, in spite of Bonaparte’s recent promotion to General-in-Chief of the Army of Italy. The genteel world would silently judge that I had married beneath me. It would be said that as a widow with two children to educate and place in the world, as an aristocrat without fortune, and indeed, as a woman over the age of thirty, I was desperate. “I — that is, General Bonaparte and I — have married.” I took my husband’s hand; it was as damp as my own. “Well.” Madame Campan made a small, dry cough into her fist. “Your children have been very good at keeping this secret, Madame…Bonaparte, is it now?” I nodded, grieved to hear my new name spoken, grieved to be giving up the lovely and distinguished name of Beauharnais. “No doubt Hortense and Eugène are…?” She held out her hands, palms up. I felt my cheeks becoming heated. “That seems to be the problem. General Bonaparte and I came out to Saint-Germain today with the intention of telling my children, but…” I tried to swallow. “She was crying,” Bonaparte said, shifting his weight. I glanced at Bonaparte. It was a coward’s solution, I knew, but a solution nonetheless. “Good,” Bonaparte said, standing. After, Bonaparte and I stood silently on the bottom stone step of the school, waiting for my coach. “I guess, under the circumstances, we should consider whether or not to visit Eugène now,” I said finally, looking out over the fields to Eugène’s school next door. On the one hand, I hated not to see him; on the other, I owed four months’ tuition. “He’s not expecting us,” I said, as my carriage creaked to a stop in front of us. Bonaparte has four brothers and three sisters — my family now. “Your sisters who are living in Marseille with your mother?” In town now, we were passing the castle, a ruin, like so many. “That’s ridiculous,” he said, opening a book he’d been reading on the way down, the life of Alexandre the Great. “Eugène’s school is even more.” And I was paying for my niece Òmilie’s tuition as well — or trying to. It had been a long time since I’d had any income from home. My coachman cracked his whip. I let my head fall back against the tufted upholstered seat and closed my eyes, the memory of Hortense’s tears coming back to me. For discussion questions: click here. For a Q & A about Josephine, click here. Mud Baths & Dusty Coffins: In Search of Josephine B. A writer’s obsession with Josephine Bonaparte has taken her through palaces and battlefields – and to a historic spa in the mountains southeast of Paris. Published in The Globe and Mail, July 25, 1998. 1. 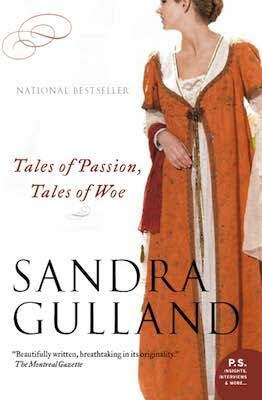 In Tales of Passion, Tales of Woe, Sandra Gulland explores one of the most volatile periods of French history. What were some of the most pressing issues of the time? What is the most interesting aspect of the period? 2. Josephine and Napoleon are generally depicted as among the great romantic/tragic couples in history. But here we meet a Josephine who often seems conflicted regarding her feelings towards her husband. She speaks of her love for him but also admits in her diary that he is, in many ways, a stranger to her. What may have been her reasons for the marriage? How did Josephine’s feelings for Napoleon change over time? 3. Josephine initially kept the fact of her marriage to Napoleon hidden from her two young children, twelve-year-old Hortense and fourteen-year-old Eugene. While Eugene looked forward to the benefits of a masculine presence in his life, Hortense was decidedly unhappy with her mother’s marriage. From a modern perspective, how might Josephine have eased the situation for both her children and her new husband? 4. Napoleon’s family appears to be a venal lot at best — his sisters, greedy and grasping, his brothers, power-hungry — all of them plotted continually against outsiders and even each other. Many modern marriages are similarly assaulted by family members with varying agendas. What differences do you perceive between the late eighteenth century and the late twentieth century in this regard? 5. Despite Napoleon’s passion and Josephine’s growing love for her husband, their marriage seems to have no hope of succeeding. Discuss the pressures — family, duplicitous friends, politicians, each with a particular axe to grind — that beset their union from the beginning. Given their respective characters, what might a meeting between the couple and a modern marriage counselor have been like? 6. Josephine and Napoleon agreed to share living expenses; even the purchase price of a country property was to be shared equally between them. Additionally, Josephine was required to pay for whatever expenses her children incurred. In this respect they had a somewhat modern marriage, but without the benefit, to Josephine, of any means of earning an income. What position did this put Josephine in? What options were open to her? Was she irresponsible in going so deeply into debt? Were her financial involvements ethically questionable? Was her spending frivolous, or might it be considered a legitimate business investment? Was it unusual for a woman to get involved in large-scale business ventures in the late eighteenth century? How unusual would it be today? Would Josephine’s financial situation and dealings be viewed differently if she had been a man? Were Napoleon and Josephine right to turn against Barras? 8. Sandra Gulland offers an array of remarkable historical characters, some known to us from our history books, others more obscure. Which characters intrigued you and made you want to learn more about them? 9. How do Napoleon and Josephine seem as people? More or less as history has depicted them? Or did you discover elements unknown to you before reading Tales of Passion, Tales of Woe? Which characteristics do you admire? 10. As we observe this period in history through Josephine’s eyes, it seems that people’s crimes, and sins, even their foibles and their affectations, have changed little in the two centuries that have passed. What do you think we can learn through the distance of historical perspective? 11. Sandra Gulland has chosen to make her trilogy of the life of Josephine Bonaparte fictional. How would this work differ had the author chosen to turn her extensive research into a narrative of non-fiction? What kind of distance would this have created? 12. Written in the form of a diary, this work of fiction departs from the typical style of the historical novel. Did you feel it brought you closer to Josephine, in particular, as she wrote of the joys and trials of her life? Would you be interested in other novels or historical fiction written in this format? 13. Josephine fulfilled many traditional roles: mother, wife, hostess. She also involved herself in politics and business. If so, in what way, and to what end? What role did she play in Napoleon’s rise to power? Of all her roles, which do you think was the most important to her? 14. In France, women’s dress had changed radically after the Revolution: no corsets or hoops were worn, no high heels, fabrics were lighter, the cut revealing, following the natural contours of the body. In what ways did the style of dress reflect the changes that had taken place in France? What periods would you compare this to in this century? When Josephine traveled to Italy, she discovered that the Italians dressed more conservatively. Why did they do so? How did the two countries differ at that point in time? 15. Josephine helped form a syndicate to sell provisions to the army. Were other characters involved in such ventures? Was it unusual for a woman to be involved? Did she understand the full import of what she was doing? Were her actions ethical? Foolish? Justified? If a woman was in need of money, what options were open to her in the late eighteenth century? What might Josephine have done instead? 16. How did Josephine feel about Napoleon when she married him? Was love considered important to a marriage? Napoleon professed to love Josephine passionately. Did he, in fact, love her?